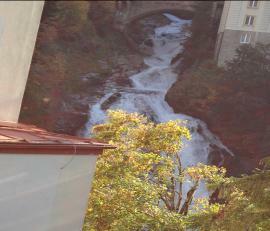 Gastein derived from the Indo Celtic word Gastuna which means a white/grey stream of water. Bad of course ,as in Hindi, means a body of water, a spring, or spa. The hot springs in the area had remarkable healing effects and soon the area became famous for the curative effects of the hot springs and started drawing people in search of cures. The Emperor of Austria Franz in the 1800s and the Archbishop of Salzburg contributed through land donations and royal funds to develop the area and soon Bathing Houses sprung up along the river flowing through the centre of the city. The Kings and Emperors of Europe started coming to Gastein to take the water treatment and then meetings and conferences between kings and emperors taking place in Bas Gastein . At that time Austria was the biggest empire in which the sun never set. 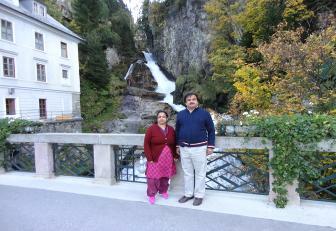 Bad Gastein became the holiday destination for Europe’s rich, powerful and the famous. In the 1950s effective Medical Treatments started coming up for the disorders which Balneology was treating and Bad Gastein started losing its visitors and importance. To take care of the issue Bad Gastein was developed into a Ski Resort and the Cable Cars, Chairlifts were installed along with artificial snow making infrastructure and today bad Gastein is one of the top Ski Resorts with "After Ski Nightclubs , Discotheques, Restaurants ,Pubs” and the Bathing Houses (like Bellevue Mondi” also, were converted into luxury hotels and resorts. The Wasserfall (Waterfall) through the centre of the city . 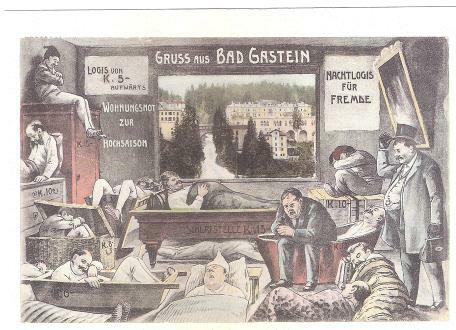 It is the same as shown in the old painting in which patients are taking the water treatment of Bad Gastein.